The Christmas Village in New York is a walk-through exhibit of twenty-one fabulously decorated scenes, with audio-animatronic elves, animals, people, and machines operating throughout. There is nothing like it anywhere in The City. Visitors get a guided tour telling the whole story of how Santa wanted a Village here as a home away from home. Admission price comes with a colorful pass the guests keep as a souvenir. Also various photo package options to purchase. Some of the scenes include Santa arriving on his reindeer-drawn sleigh to a NYC Yellow Cab, the North Pole Depot featuring a huge replica train, Santa’s Workshop with elves working away making toys, the Claus Home, Mrs. Claus’ Sweet Shoppe for baking his favorite cookies, the Mulberry Street Pizzeria for his favorite snack, Rudolph’s Barn where all the reindeer play, an Arctic Scene with a family of Polar Bears, a NYC skyline complete with a mechanical vintage biplane like the ones that King Kong fought on the Empire State Building, a revolving Christmas Tree Carousel, and a dozen more scenes, including a traditional Nativity. This is a Magical Christmas Tour in New York, and you will want to make it an annual tradition to visit. 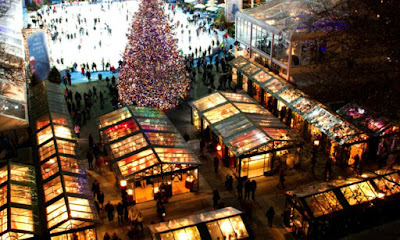 Christmas Village in NY is located in the lower level of 530 Fifth Avenue, just a few blocks down from Rockefeller Center.